When it comes to barbecue food we’ll admit that the North Americans can be a cut above. Whilst we dream of an open pit deep in the heart of Texas those of us in London can still get a taste of greatness. Bodeans prides itself on it’s ‘smoke it slow, cook it low’ approach and it works an absolute treat. We regularly head down to their Soho location and it’s time to share their story. Thanks to Richard Lunn for this image. Clicking on it will open his blog! The Joint: Bodeans BBQ, 10 Poland Street, Soho, London, W1F 8PZ. You can find their website here. The vibe: A thriving joint with a healthy, but quick, queue is often a sign of good food and Bodeans is no different on that front. Their Soho location is split over two floors, a deli at street level and a restaurant down below, and it’s often packed from 12.30pm onwards. With that in mind we head down for mid day and get our choices of seats and opt for the one in front of the ice hockey. That’s one of our favourite parts of Bodeans too, the sports on offer on a number of screens. There’s always something worth watching whenever you turn up. You order at the counter and wait for your number to be called, and when ours is up we’re greeted by the Boss Hog Dog and a can of pepsi max (other brands are available). 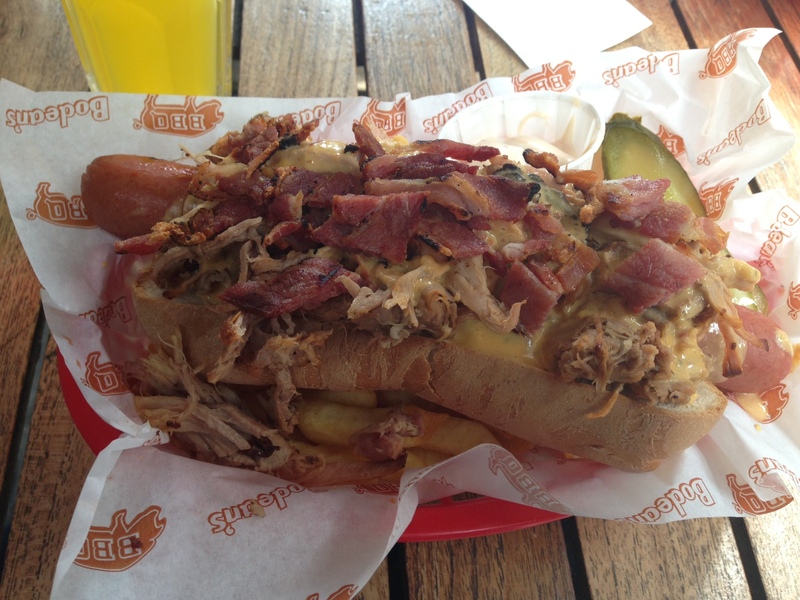 The Boss Hog Dog is Bodeans well cooked 1/4lb hot dog covered in juicy pulled pork, tasty chilli con queso cheese sauce, and crispy bacon. It comes with a side of salty fries and a pickle too, so don’t forget to add that to your five a day list. This hot dog is huge in size and huge in taste and that’s largely down to the toppings – the pulled pork is as good as we’ve tasted and the chilli con queso adds extra moisture and a nice heat too. Bodeans offers a diverse menu for meat lovers and we’re keen to go back and get to know their burnt ends, buffalo chicken wings, and grilled corn on the cob. We’re never disappointed and you wont be either. The price: You’re looking at £9 for the Boss Hog Dog and a few pounds more for a soft drink. It’s worth it though. Have you eaten at Bodeans in Soho, London? If so tell us how you got on over at our Twitter profile – @OutForLunchBLOG. Posted in LondonTagged barbecue, BBQ, Bodeans, boss hog bog, buffalo wings, burger, burnt ends, chicken wings, chilli con queso, grilled corn on the cob, Hot dog, London, pulled pork, sohoBookmark the permalink.